Some 80% of Chad’s population live in high malaria transmission areas, with 1.1m confirmed cases and 1,509 deaths reported in 2014. Malaria is the greatest cause of illness and mortality in children under five, representing 37% of all consultations in health facilities. Transmission of malaria varies greatly by climatic zone, with no malaria in the northern desert, a short two-to-three month malaria season in the central region and a longer four-to-seven month season in the south. 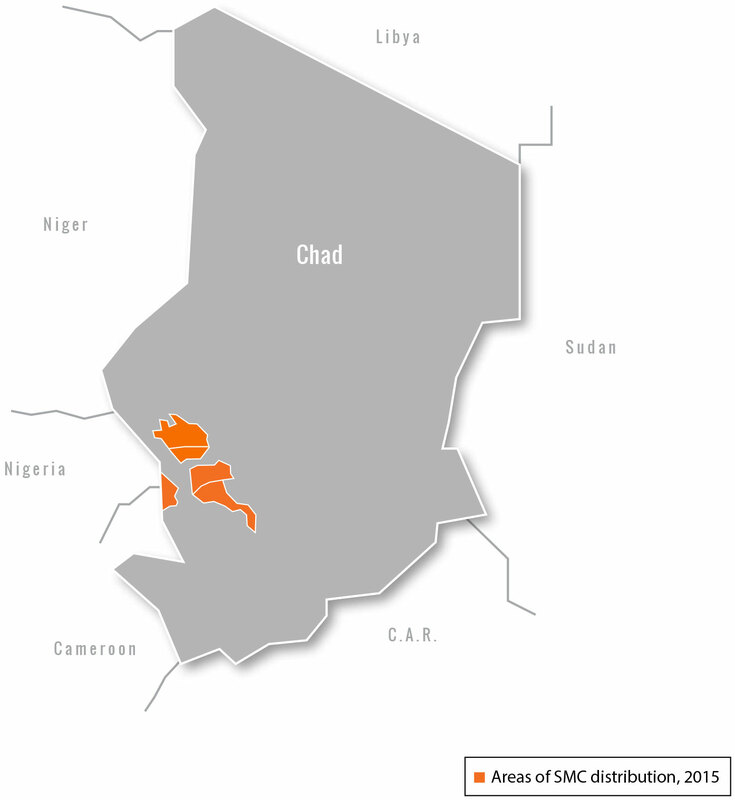 Which areas of Chad are eligible for SMC? With high levels of malaria transmission during a short rainy season, central areas of Chad are optimal for SMC implementation. While malaria rates are higher in the south, the rainy season last up to seven months. Given that this is significantly longer than the maximum of four months of protection offered by SMC, the south of Chad is not considered suitable for roll-out. What is Chad’s experience with SMC? Prior to ACCESS-SMC, SMC had been implemented in recent years on a limited scale. This was led both by THE NATIONAL MALARIA CONTROL PROGRAM (supported by UNICEF, in the center-east region), and by MSF (in the south). Where is SMC being delivered? ACCESS-SMC is supporting Chad’s NMCP to deliver SMC to over 260,000 children in six districts. In the Chari-Baguirmi region, ACCESS-SMC is working in Mandelia, Dourbali and Massenya districts, ensuring over 140,000 children get access to SMC during the 2015 rainy season. When is SMC being delivered? In Chad, SMC is being delivered to children from July, with monthly distributions continuing until October. How is SMC being managed? ACCESS-SMC aims to ensure that our delivery of SMC also creates a sustainable system for others to use beyond the duration of our project. For this reason, SMC delivery is being led by the Chad NMCP, supported by regional health delegations and health districts. ACCESS-SMC is providing technical, logistical and financial support to plan, prepare for, implement and evaluate SMC in 2015 and 2016. How is SMC administered in Chad? In Chad, ACCESS-SMC is delivering SMC over four days each month (a ‘cycle’) by 1,375 teams of two trained volunteer community health workers (CHWs). In Chad, SMC is being delivered principally using a ‘door-to-door’ approach, although a ‘fixed post’ methodology is used where health authorities consider it to be more appropriate. ‘Door-to-door’ methodology: Where this approach is used, SMC drugs are administered each month in children’s homes. CHW teams travel to the houses of all eligible children in their assigned community. ‘Fixed post’ methodology: Where this approach is used, CHWs administer SMC to children from specific administration points within the community, announced in advance. Examples include markets, temples, mosques, churches, mills and wells, making them easy and convenient for parents to take their children. ACCESS-SMC is working with CPA, the Chadian health system’s central supply chain department. Together we are coordinating the receipt in country, clearance, storage and transportation of SMC drugs down to the district medical stores. We distribute drugs to the health centers two days before the start of each SMC cycle. During the cycle, CHWs collect the SMC drugs each day from the health center, returning them at the end of the day. ACCESS-SMC and NMCP monitor the drugs’ progress through the supply chain using the Logistics Management Information System (LMIS).